When most people think about demolition, they envision wrecking balls plowing into the side of buildings or controlled explosions causing massive structures to sink into their foundation. But demolition is an involved and delicate process. There’s so much more that goes into the destruction of a structure than the simple act of knocking it down. In fact, there are four very important steps that all demolition teams must undertake before they can even think about starting the process. Only once all of these steps have been completed can a team move in and start tearing the structure down. But what goes into these four key components of demolition that most people never see? And why is it important to hire the best team available to ensure that it’s done right? To survey a structure is to study the different parameters of the building itself and the area immediately surrounding it. This is typically undertaken in two steps. They are building surveys and structural surveys. Surveying a building for demolition involves a lot of in depth analysis. We need to look back at its initial construction to gauge a few key components. First off, we need to know what materials were used when the building was erected. Different materials require different strategies when demolition time comes around. We also need to know what the building was used for prior to demolition. Was it a residence? A business? Did anything occur within that could change our overall strategy? Were harmful chemicals stored on the premises? These are all things that we need to know. Speaking of chemicals, we have to determine if any hazardous materials exist within the structure. This includes wastewater, toxic chemical matter, flammable elements, and explosive or radioactive materials. Drainage is another big concern. We have to gauge all possible water related issues, including pollution, flooding, and erosion. If the building is sharing any facilities with an adjoining structure that’s something we need to address. Are there common walls, entrances or staircases? It would not be a good thing if another building came down with the first one. We have to gauge the neighborhood as well. What does the through traffic look like, both pedestrian and vehicular? How will the surrounding area handle the noise, vibration, and dust? Are we creating a traffic hazard? Once we know all of that, it’s time to survey the structure itself. What method was used when the building was constructed? How is the structural system laid out? What is the make up of the basement? Are there any underground vaults or tanks that we need to map out? Certain materials can cause adverse environmental and health conditions if exposed to the air. That’s why before demolition can occur, we have to remove these materials, lest we cause severe issues for the surrounding area. Some of these include petroleum contamination, asbestos, or radioactive metals. We carefully remove these items from the site, disposing of them properly. It would not do well to release a cloud of asbestos into the sky as the building comes down. Once hazards have been removed and both building and structural surveys have been completed, then it’s time to create the demolition plan. Yes, there’s a plan. You don’t just go in like the Hulk knocking buildings down. A number of factors have to be taken into account and plotted strategically. We take note of the location of the building, determining the distance between it and the adjacent structures, including buildings, streets, and street furniture. We map out the buildings structural support to help us figure out the most efficient plan of attack. Then we begin to plan out the demolition procedure. That includes identifying the sequence of structural members that will be demolished and the demolition method that will be employed. We also lay out protective measures such as covered walkways, catch fans and platforms, protective screens, hoardings, and safety nets. Finally, we determine what our method will be for handling the debris left behind and lay out the time required for the entire process to be completed. Before we start demolishing, the last thing we have to do it put all safety measures in place. All essential staff members are briefed as to what hazards exist and what our process is going to be. We make sure that all non-essential flammable materials are removed. That includes any fuel, oil, timber, or wood. We make sure that these are stored in a proper facility far away from the demolition site. We surround the demolition sight with firefighting materials and they remain there throughout the entire process. We find suitable measures to protect our workers. There are multiple hazards which can adversely impact crew members, including chemical exposure, heat stress, dust exposure, noise exposure, ventilation, sanitation, and occupational diseases. We ensure that medical and first aid facilities are readily available. Demolition is more than just knocking over a building. In-ground structures like foundations, basements, and in-ground pools are also part of the process. We break up the concrete surrounding the pool or foundation and then break up the walls and floor. We remove the remaining debris, hauling it away in a dumpster. Any wood or aluminum framing that surrounds the perimeter also has to be removed. Then, we have to fill the hole left behind with dirt or gravel. Once the site is graded, it is ready for grass seed to be laid down, or for a new structure to be built. So much work and finesse go into the demolition process. It’s more than the mindless smashing that most believe it to be. When you’re planning your next demolition, whether it’s a commercial building, a home, a garage, or an in-ground pool, remember that you need a detailed and accurate team ensuring the safety and security of your property throughout the process. 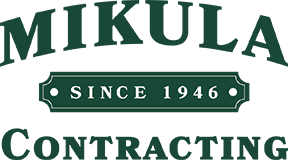 Call Mikula Contracting for all of your New Jersey Demolition needs. We can be reached via phone at 973-772-7684 or reach out to us online.